We had some great weather here on Saturday, so we packed up the mini van and headed out to Franz's place. Only it wasn't just any Franz - it was Franz Ferdinand. And it wasn't just any Franz Ferdinand - it was Archduke Franz Ferdinand. Oh - yeah, and it wasn't just any old Archduke either. 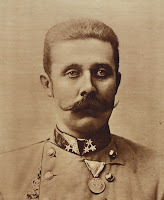 It was Archduke Franz Ferdinand d'Este, Prince Imperial of Austria and Royal Prince of Hungary and Bohemia, and heir presumptive to the Austro-Hungarian throne. You know, the guy whose assassination in 1914 kicked off the First World War. With a title like that, you've gotta figure Archduke Franz had a pretty nice place - and you're right. 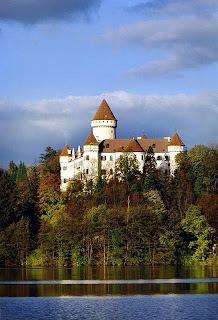 Nestled in the forest, high above a lake and elegant gardens, Konopiste Castle today is a showcase to the Archduke's three passions - hunting, travel and jousting. The castle lies about an hour by road from Prague. Parking in the big lot below the castle will set you back 60 Czk per car. 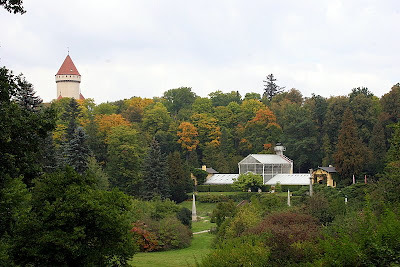 From there, you can hike past displays of cheesy souveniers, about a kilometer up the hill to the castle. 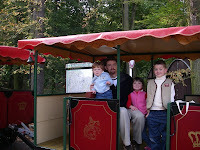 Alternatively, you can hop on a "train" for the uphill journey (150 Czk for our family). Once the kids caught sight of the brightly painted train, it quickly became the only real transportation option! 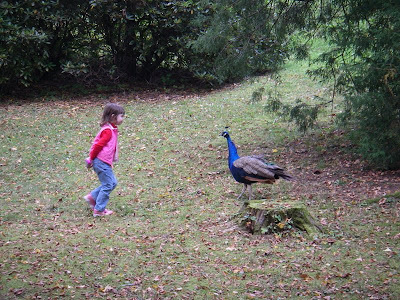 The train drops you off at the upper gardens, where you can wander between statues (the stone lions make for great riding) and leafy trees, chase real, live peacocks and make your way to the castle moat. Now I've heard of moats filled with water, guarded by crocodiles... but never before a moat guarded by a real life bear! Why, you could watch a bear walk around in circles for hours! The main entrance to the castle interior lies around the back of the castle - past massive doors which guard the entrance. Here's where you can buy tickets to one of a number of guided tours which lead you through the castle's real wonders inside. We picked "Tour 2" - mainly because it was in English and at the right time of day. On crowded days, you may want to make a reservation for a particular tour ahead of time via the castle's tour reservation system. Any good hunter (and Franz was quite a hunter) keeps a nice collection of weapons. Our Archduke, however, went a bit overboard. 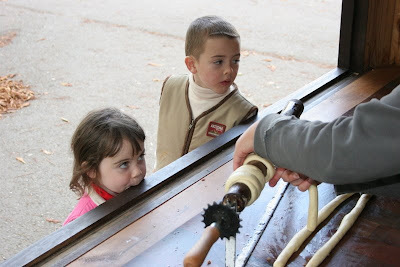 The halls of the castle are lined with thousands of elaborate swords, crossbows, and guns of all shapes and sizes - and that's even before you make your way to the Armory. The castle also has a very small percentage of the Archdukes "Prizes" (animals he bagged). Our guide calmly informed us that the good Archduke took down over 300,000 animals in his career as a hunter. We did some quick math and figured out that would have come out to about 20 animals each day of his hunting career. A bit far inflated, we thought... but he definitely had an interesting collection - including animals from the US, the far East, and even some bits and pieces of three elephants shot during a trip to Sri Lanka. A couple of the highlights of the tour were the visit to the family's private chapel (the family occupied a heated side area of the chapel, where the rest of the servant folk were in the main Nave of the church); the hydraulic elevator, complete with comfy lounge chairs for the minute-plus ride up two floors; and the library, home to hundreds of books hundreds of years old, as well as life-sized portraits of the family. The men's salon / smoking room (featured in the movie The Illusionist) leads to a lavishly decorated "harem" - appointed in middle-eastern style. Our guide assured us that only the men gathered there (not the harem). The tour cost us a bit over 400 Czk, but was well worth it! We grabbed a quick bite to eat in the canteen next to the greenhouse in the elaborate formal gardens of the castle grounds before heading home. A better option? Bring a picnic lunch to enjoy on a nice day (but remember not to feed the bear!) The walk back downhill to the parking lot was an easy one... even for the three tired kiddos. A Trdelnik stand in the parking was just what we needed to wrap up our visit to Franz's hideout in the hills. There's nothing like warm roasted cinnamon dough coated in sugar and nuts to fix those last-minute munchies! I finished 47th in a Triathlon this weekend. To be precise... my finish time was the 47th-best of all the non-junior category man racing the "Open" sprint-distance triathlon. Now, if you're thinking 47 is rather a large number... well, you're right.. actually. To my credit though, it has been a long time since I've run one of these races... and I really haven't swum more than a lap or two since left the balmy waters of the Arabian Gulf... and - oh yeah... some of the other triathletes in the water on Saturday were actually members of the Czech Olympic Team! Anyway - my finish time of 1 hour, 25 minutes 41 seconds was a WORLD RECORD for people named Kevin Rubesh participating in this particular race. And it was fun! One of my colleagues at work convinced me to join him in the Open Triathlon just a couple days before the race. The Open category was open (thus the name) to non-club racers, and was "just" sprint distance - 750 meter swim + 20 km bike ride + 5 km run. Because it was run at the same time and on the same course as the Czech National Championship race - an Olympic distance race going double the distance in each discipline - the Sokolov Triathlon attracted pretty large crowd - 140 competitors in total! As usual, I came out of the water in about the middle of the pack, and proceeded to lose ground dramatically during the bike and the run. One fun bit about this race - since it was the National Championship - it was televised. This meant that while I was huffing and puffing along on my bike and on the trail, I was passed not only by elite Olympic athletes going at least double my speed... but also by the TV crew on motorcycle. Fun! I actually made a brief appearance on the TV broadcast - hit play on the video clip to the right, and fast forward to minute 36 or so. Behind the woman being interviewed, you may be able to spot a tall fellow in a blue shirt walk across the screen, then plop down on the grass to stretch after finishing the race - yep, that's my grand entrance to the Czech National TV scene! Being a Czech triathlon, the race was followed by an extensive raffle prize giveaway - including gifts such as homemade bread and salami, umbrellas, food baskets... and even a plasma-screen TV! 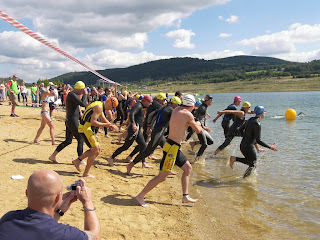 Unfortunately, this is the last race of the Czech Triathlon season... but I think I've just been re-hooked on this sport. My goal for next year? The coveted 45th spot on the podium (and some salami, of course).